Lampwork is a type of glasswork used to create smaller glass objects using a fixed directional flame to melt the glass, whilst using lamp working tools and gravity to shape the piece. It is a very different process from glass blowing which as the name suggests uses a blowpipe to inflate a glass gob or gather to form a cylindrical glass shape which can then be shaped with glass blowing tools. These small handcrafted lampwork pieces are the most time consuming method of making glass beads as each art bead is individually made over a flame, resulting in labour intensive but beautifully bespoke one of a kind beads. Lampworking is the result of a combination of chance – that first piece of natural glass falling by accident into an open fire – alongside a long history of innovation, development and refinement. It is impossible to really determine when lampworking as a process was born but many of the elements that make lampworking what it is today can be traced back through the centuries to when mankind first discovered how to make glass. Through archaeological excavations and examination of early glass artefacts it is known that small open fires were used for all forms of early glass making. In time small earth formed beehive furnaces were introduced. These primitive furnaces are known to have been used in ancient civilizations from Japan to North Africa, and seem to have dominated glassmaking prior to the birth of Christ. It was the Romans who took this basic beehive shaped furnace and refined it with the addition of exhaust vents and side access, creating what would effectively become the first true glass furnace. Alongside this they also developed and refined new glass working tools for shaping the glass that they produced. Glassmaking became a sophisticated and highly successful industry during Roman times, with 600 years spent refining their techniques until they were adept at shaping glass, colouring glass, recycling glass and even more impressively removing colour from glass until it was almost clear. The next significant phase in glassmaking followed the sacking of Rome in the 5th Century and the rise of Islam and the exquisite artistry that this culture embodied. It is in the 10th Century, specifically 982AD, that the first recorded reference is found to Venetian glassmaking. In the 13th Century Byzantium was captured by the Franks and the Venetians, with Islamic glass making techniques quickly adopted within Venice’s established glass making industry. The epicentre for glass making had now moved to Europe. As Venice’s glass making industry moved from strength to strength it benefited from the Republics status as a major trade centre for Europe, Asia and North Africa. Keen to keep their competitive edge the Venetian authorities introduce protectionist measures banning the import of foreign glass, whilst ensuring Venetian glassmakers were discouraged from disclosing their techniques by moving their foundries to the isolated Island of Murano in the Venetian Lagoon. To read more about this particular region and its intriguing history have a look at our History of Venetian Glass Making in our Guides & Information section on our website or on this blog. Times have now changed, and tourists are encouraged to visit the original glass furnaces and workshops on Murano to see how the workers create glassworks using methods unchanged for hundreds of years. Following the continuing dominance of Venice in glass manufacturing and the pivotal moment Angelo Barovier invented cristallo clear glass in 1450, we jump forward to the early 17th century to find French, Germany and Italian glassworkers using the flame of an oil lamp or spirit lamp to heat and manipulate small quantities of glass. The glass workers would raise the temperature of the flame tip by blowing air into it through a narrow pipe or tube. This would generate sufficient heat to melt the softer types of lampwork glass rods available to them. 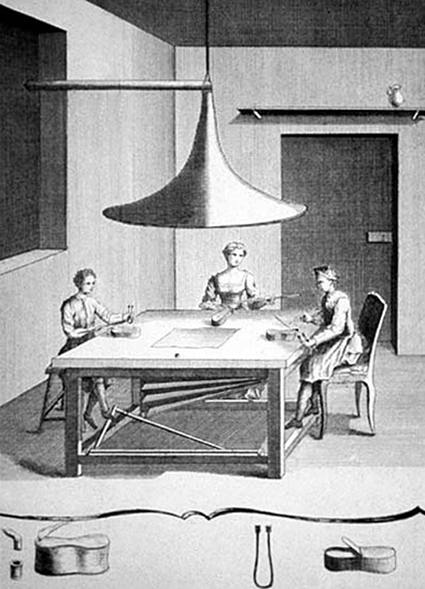 So this is where the lamp in lampwork originated from, providing the first significant parallel between historical glass manufacturing and modern lampworking today. Working in a hot environment this lampworking technique proved less than ideal as workers were unable to blow into the pipe or tubing consistently for any length of time without experiencing dizziness, or passing out through lack of oxygen! The first much needed refinement to this process was a hand blower, or hand bellows, as illustrated in the plate below. 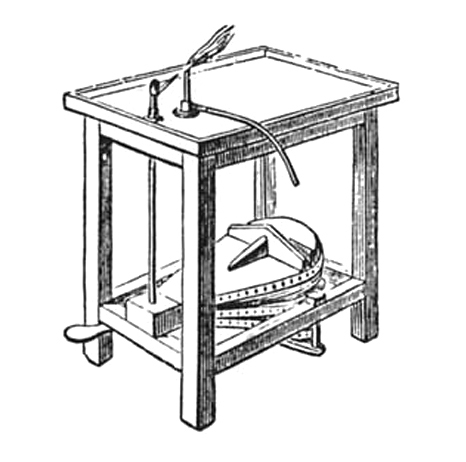 Although this was a significant improvement it had two drawbacks – it required one hand to operate the bellows and it lacked a mechanism to ensure a consistent flow of air to the flame. Simply put the bellows had to be released in order to refill them with air for the next pump. 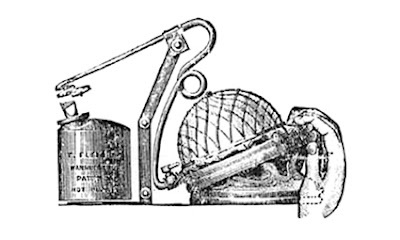 The next development introduced a foot operated bellows which freed up the workers hands so that they could again be focused on shaping the glass, but it still lacked a mechanism to drive a consistent flow of air through to the flame, without which a uniform temperature could not be focused on the heated glass. The final refinement needed was an expandable bladder attached to the foot bellows which meant air could be stored prior to being pushed through to the flame, giving a more consistent flow of air to the flame. 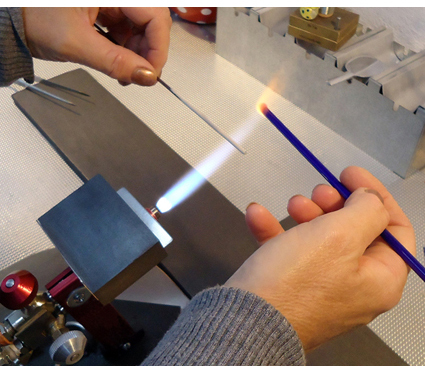 This would give the lampworker the ability to selectively heat areas of the glass object being worked on, bringing greater refinement and accuracy to the process. With the bladder system in place this lampworking process proved more economical and energy efficient, whilst allowing for greater intricacy and detail than could ever be achieved by glassblowing. It essentially brought down prices for glass objects and placed them within the reach of a far wider customer base. It is worth noting, in the plate below, that the lamp working industry employed both men and women and that this was particularly evident in Venice at the peak of production in the1800s. Women would be employed to add the decorative elements to Venetian glass Trade Beads destined for Africa and the Americas. The bead cores were still produced in an industrial, male dominated environment centred around large hot glass furnaces, but the glass decoration and detail would be added later. This task was undertaken by home workers, most of whom were women, paid on a piecemeal basis to use an oil or spirit lamp to re-heat the beads whilst adding strings or dots of coloured glass. Following the fall of the Venetian Republic to the Austrians in 1797, Venetian glass production went in to sharp decline. With Austrian backing the region of Bohemia started its rise as the new centre for glass making in Europe, a subject which is covered in greater detail on our website in our History of Czech Glass Beads or on this blog. That is until the mid 19th Century when Venice regained it’s independence and a new breed of glass maker reinvigorated Venetian glass production. They took their inspiration from Murano’s golden period and by rediscovering long forgotten glass making techniques they brought new life to the furnaces of Murano. This takes us neatly to the turn of the 20th Century when events takes us across the Atlantic to America, albeit via Germany. In 1893 borosilicate glass was invented by German chemist Otto Schott who founded Schott AG in the same year. This revolutionary product was made from silica and boron oxide which in combination formed a very stable glass with good workability and high thermal shock resistance. It was manufactured under the name Duran and for a time was very successful. However, during the First Word War, the arrival of Pyrex from America provided a non German alternative for patriotic English speaking consumers and Pyrex soon becaming a generic term for this type of glass. Pyrex was derived from Nonex glass which was developed in 1908 by Eugene Sullivan, Director of Research at Corning Incorporated Glass Works in New York. This was a borosilicate low-expansion glass initially used to reduce breakages in shock-resistant lantern globes used on the railways as well as battery jars. In 1913 Jessie Littleton, a scientist working at Corning realised this glasses potential for cookware, when he gave his wife an oven proof dish for cooking with. By removing the lead from the Nonex glassmaking process Pyrex was born – some 20 years after Otto Schott first introduced the world to borosilicate glass! A good 15% lighter by volume and much stronger than soda based glass, Pyrex became an immediate success as a consumer bakeware product as well as for laboratory ware and telescope lenses. However, its melting point was so high that existing oil lamps could not melt the glass and so the material could not be easily worked. With the glass industry having always been innovative it looked to the welding trade for a solution. In time, by combining oxygen and natural gas, new burners were designed that produced a flame of sufficient heat to melt Pyrex glass rods. 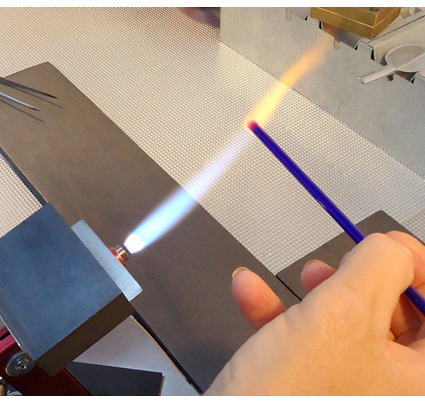 These flameworking torches quickly replaced traditional oil lamps both in mainstream production and at the workstations of glass artists and artisans who quickly adapted this new glass for artistic and novelty lampwork glass pieces. In Europe, and in particular Czechoslovakia, Italy and Germany soda glass remained the norm as did the old techniques that had ably supported this industry for centuries. However, history has shown that they were not adverse to adopting techniques and innovations when needed and they were quick to see the benefits of the new gas burning torches in place of their now outdated oil lamps. So for many years glass making skills remained squarely in the Old World whilst the New World pushed forward with technological developments in glass production and factory automation. That is until some 25 years ago when the playing field was levelled somewhat by a group of American glasswork artists who, having either visited the foundries in Murano or been influenced by European glassworkers living in America, sought to recreate what they had seen. Although hampered by the secrecy and fear of competition that still shrouded lampworking production in Europe they used experimentation, documentation and collaboration to progress from initially crude lamp work beads to the levels of art glass lampwork that is evident today. Alongside the growth in their abilities came new glass bead making tools, glass torches and other equipment and lampwork supplies which were tested, developed and put into production. This contemporary lampworking collective eventually formed the nucleus for the International Society of Glass Beadmakers. With much credit afforded to the aforementioned group, lampworkers throughout the world have become recognised in their own right as artists and many galleries now exhibit lampwork glass – displaying the lampworkers individual creativity, style, technique and understanding of colour. Their work is shown and sold alongside the more traditional mediums of glass blowing and casting, as well as painting and sculpture, in the art galleries of Europe, Japan, and the United States. With the growth of the internet those with shallower pockets can also buy artist made lampwork bead sets from independent bead making artists, often sold through their own web sites, or through online market places such as Etsy and Artfire. At the bottom end of the scale you can also buy lampwork beads that are mass produced in India and China – just don’t expect to create one of a kind jewellery with that unique focal point that artisan lampwork beads can give to a jewellery design! BigBeadLittleBead offers a selection of over 250 one of a kind lampwork glass beads for you to choose from, created by our own talented lampwork glass bead makers. For those that are working to a tight budget we also stock a selection of Chinese lampwork beads and Indian lampwork beads. 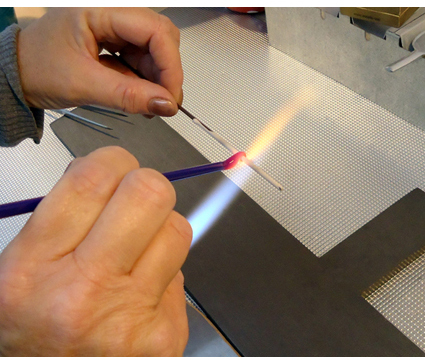 As touched on earlier the lampworking process today is almost unchanged from centuries gone by, with a flame still the only method used to melt the glass rods. 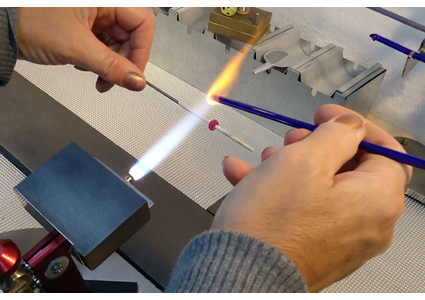 The principal difference today lies in changes to the delivery of the flame, with modern lampwork bead makers using single or dual fuelled torches clamped to their workstations. Most lampwork artists use a bead making torch that burns either propane or natural gas for the fuel, surface mixed with air or pure oxygen (either from a tank or a lampwork oxygen concentrator) as the oxidiser. This creates a cleaner and quieter flame. It is this change that has seen lampwork sometimes referred to as flamework, and in turn lampworking as glass flameworking. Some lampwork torches can also be run from portable gas canisters but these are usually only used by hobbyists or for demonstration purposes. The most common glass used today remains soda lime glass or soft glass and as a basic material it is no different to the Cristallo glass developed by Angleo Barovier in the mid 15th century and used by glassworkers from then onwards. This glass melts at a relatively low temperature allowing the bead to be kept warm whilst being manipulated reducing the possibility of cracking. The other option is Borosilicate glass, also known as boro glass or hard glass, which as we have seen originated as a laboratory glass, but is now also used for lampworking. Both of these glass types have their own merits depending on their application. The principal benefit of soft glass is its melting point, however it does not react well to temperature changes in the way that boro glass does. Because soft glass expands far more than hard glass when heated, and contracts more when cooled, it is far more prone to cracking through thermal shock. If, for example, a section of a bead cools too quickly that point will solidify faster than the surrounding glass causing a radial crack. Hard glass, or borosilicate glass, would be more resilient in this example. It is considered to be far more forgiving to work with, but on the downside it has a narrower working temperature range than soda-lime glass, fewer colour options, and borosilicate glass rods are more expensive to buy. In addition, its higher working temperature range means a larger and subsequently more expensive lampworking torch is needed. Typically this will use oxygen rather than air to work the glass because of its higher melting point, bringing added costs and some additional safety factors. There are many lampwork bead tools and presses available for shaping hot glass to produce a variety of complex shaped beads. 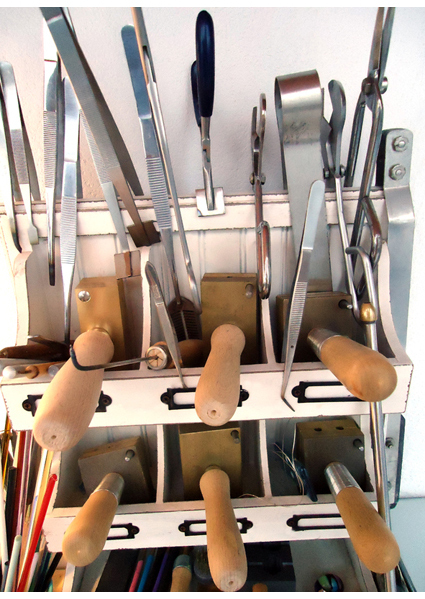 These are commonly made from brass or graphite to avoid the glass sticking to the tool face. Although now more sophisticated in their use of technology and materials, many of these flameworking tools are simply re-workings of the tools that were used widely in Murano and elsewhere in Europe for centuries. Time has shown them to be the most effective way of manipulating and shaping glass. The following list details a core set of tools for the lampwork beginner, which as you become more experienced will open your eyes to additional lampwork tools and lampwork supplies based around the designs you want to make. Torch – There are many models on the market with the innovative Nortel Mega Minor gaining good reviews with its useful torch mounted marver. Ultimately the choice depends on your budget, your skill level and the glass that you will be working with. Mandrels – These stainless steel rods are the base upon which glass is wound to form a bead. The diameter of the bead mandrels determines the size of the bead hole. 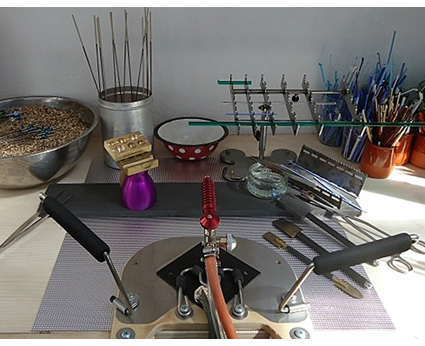 Various sizes are available but for a beginner a 2.4mm mandrel is recommended. There are much larger mandrels for lampworking available but they get heavier as they get larger. As you improve you can reduce the mandrel size to create beads with smaller holes. 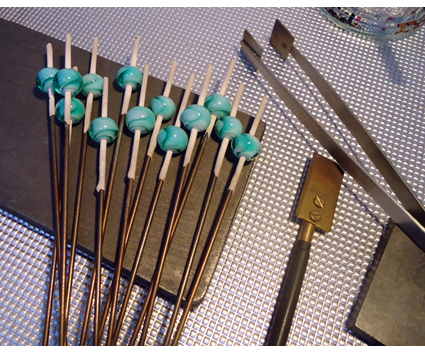 Bead Release – A clay like substance which the lampwork mandrels are dipped into to prevent the glass sticking to the steel mandrel. Goggles – Protective eyewear. Didymium lens safety lampworking glasses are essential. Marver – A graphite or brass paddle originating from the French word marver which translates as marble. This heat resistant surface is used to roll, press and shape hot beads. Marvers can be flat or patterned. 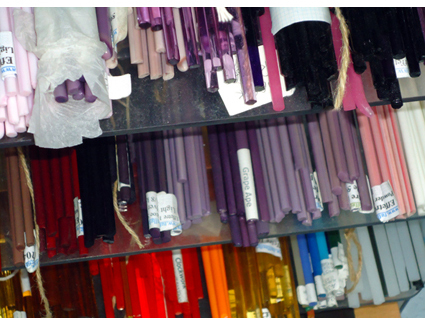 Glass Rods – Moretti Effetre glass, CIM glass, Bullseye glass and Lauscha glass are four of the more popular manufacturers of glass lampworking rods but there are many others brands of glass rods for bead making available. Their diameters vary but should not usually exceed a quarter of an inch for bead making glass. Vermiculite – A natural mineral that expands when heated. A large bowl filled with vemiculite pieces can be used to gradually cool warm beads. 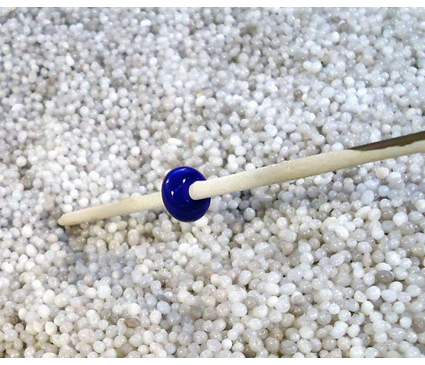 Japanese Annealing Bubbles – Tiny, hollow micro spheres made from silica again place in a large bowl they can be used to gradually cool warm beads. Fibre Blanket – Made from insulating ceramic fibres these blankets are used to gradually cool warm glass beads. Temperature Ready Lampworking Kiln – This large kiln like container can be used to gradually cool warm beads. If you intend to sell your lampwork beads it is important to anneal your pieces in a kiln to ensure strength & durability. Beads should be heated to between 940º-1050°F (depending on the glass type), until the glass reaches its stress relief point. It should be held at this temperature for a short time before being slowly cooled to avoid thermal shock. The annealing process will result in a lampwork piece that will last for many years and be durable enough for everyday wear. Glass which has not been annealed may crack or shatter following seemingly minor temperature changes or shocks. It is also essential that you work in a well ventilated room and are safety conscious. Take the bead out of the flame. It is best practice to just lower the mandrel towards the worktop remembering to keep the mandrel horizontal. Keep turning it and the glowing orange hot glass will shape itself by means of gravity. Don’t forget to keep the mandrel level otherwise the bead will become lopsided. When the bead has cooled slightly and lost its glow place it into your chosen cooling medium – the bead annealing kiln, annealing bubbles, fibre blanket, or vermiculite. Be patient and do not be tempted to examine the bead for at least 45 minutes as it will be very hot! When the bead is cold remove it from the mandrel, clean out the bead release, wash it, dry it and admire it! When you have perfected making round handmade lampwork glass beads you can start to add surface effects by decorating each bead with stringers using fine glass rods creating lines or dots on the surface. Cold working can also be employed. This includes such techniques as sandblasting, faceting, polishing, as well acid etching the finished piece to leave a matte sea glass like finish. The design and decorating possibilities are endless – limited only by the skill and imagination of you as the lampwork beading artist! As you get more adept you can explore other lampwork flame techniques, for example, layering different colours of glass to create depth and pattern, adding inclusions into the beads such as silver, gold or copper leaf, melting and racking lampwork frit across the surface of the beads, or creating hollow lampwork beads. Adding enamels, imitation gemstones or small flowers called millefiori are also popular. Lampworking can also be used to create other types of artwork, including lampwork figurines, trinkets, curios, floral lampwork, Christmas tree ornaments and much more. You will also find lampwork bead classes, usually run by local lampwork bead artists, in most regions of the country.